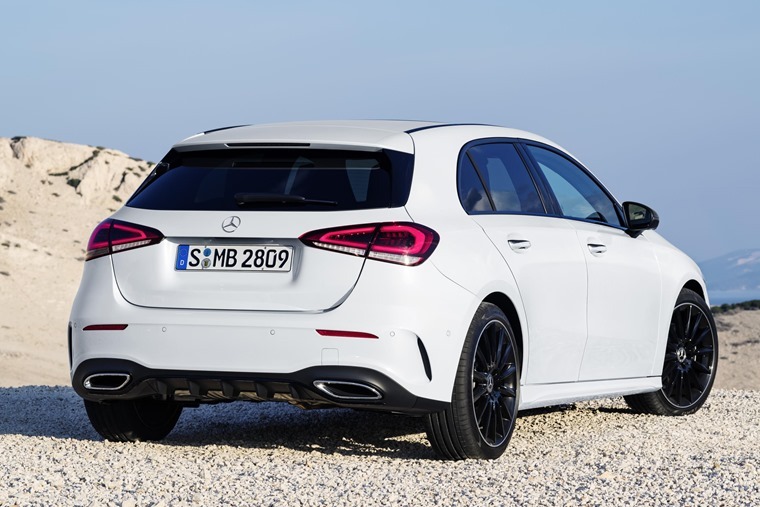 Two diesel engines have been added to the Mercedes A-Class line-up in the form of the 200d Sport and 220d AMG Line. The hatchback is available to order now, with monthly rates priced from less than £250. You can find all deals by clicking here, or read on for all you need to know about the new A-Class. The thoroughly refreshed hatchback is aiming to take on the latest Audi A3 and BMW 1 Series with a host of new tech inherited from Mercedes’ larger cars. 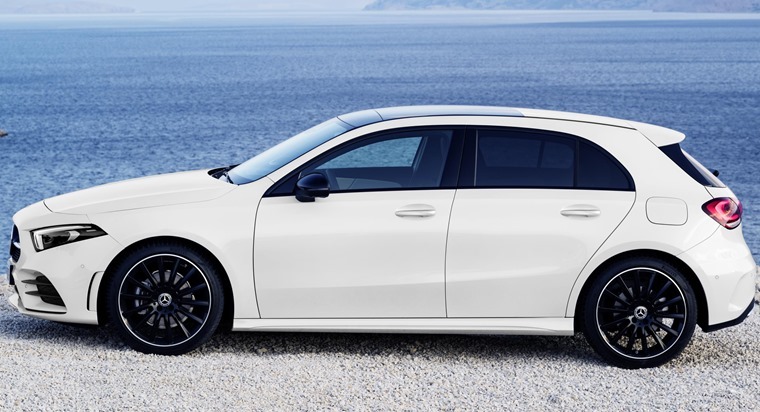 Following the current hatchback trend, it’ll launch in five-door form only at first, although a Saloon variant is due to hit the market next year. 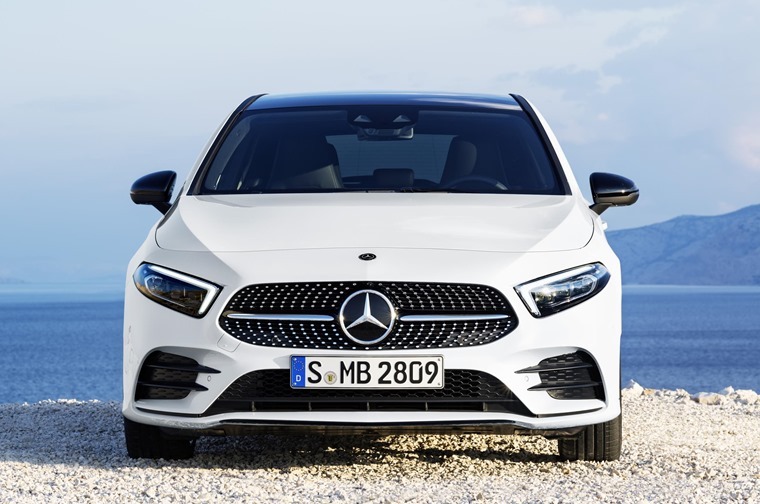 The new A-Class is 30mm longer than the outgoing model, and uses the same design language as the recently revealed CLS – something Mercedes calls “Sensual Purity”. A lower, flatter bonnet features, as do raked, slim LED headlamps and a more prominent grille. The sharp appearance isn’t just for looks either – it boasts a drag coefficient of 0.25 and boasts clever design quirks that ensure drag is kept to a minimum. Inside, changes are even more dramatic thanks to a host of tech and trim that has been borrowed from the brand’s E- and S-Classes. The most prominent feature are the high-tech free-floating screens that dominate the dashboard. Their size depends on trim level, but even entry-level models will feature two vivid 7in monitors. Higher models will benefit from one or two larger 10.25in screens. Whichever one you go for however, you won’t be disappointed. The screens are better integrated than the outgoing car, and thanks to the minimalist heater panels and some jet-fin heater vents, this is really one of the classiest interiors ever to grace a hatchback. 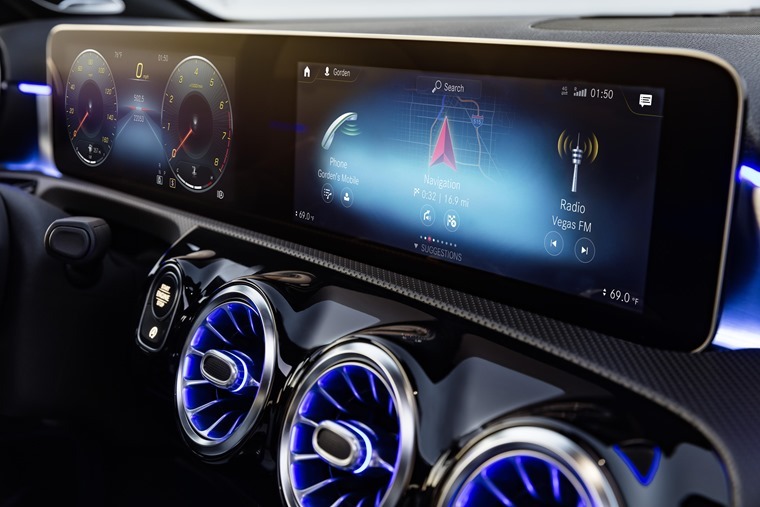 The infotainment system utilises MBUX – Mercedes’ latest running system as demonstrated at the CES. As well as the touch controls on the central screen, steering wheel and touchpad on the centre console, intelligent voice control with natural speech recognition features, which the driver can activate by simply saying: "Hey Mercedes". Its opulent feel is boosted by increased space, with all passengers benefiting from more shoulder and head room, while boot space is up to 370 litres and features a wider tailgate (+20cm) and a longer floor (+11.5cm). Three trims are to be offered – SE, Sport and AMG-Line. 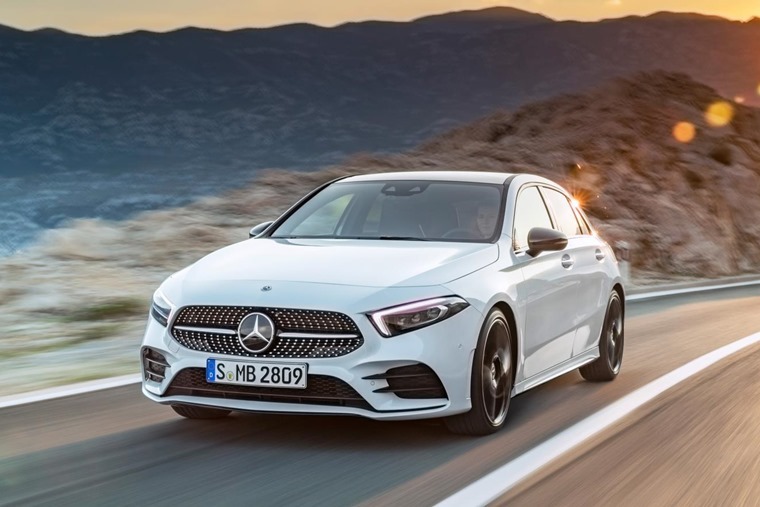 Like other manufacturers, Mercedes is moving away from “set” pricing on trim levels, and will be offering a range of personalisation packages on all models of the new A-Class. The entry-level SE features twin 7in displays including a central touchscreen with the aforementioned MBUX multimedia system; comfort suspension; 16-inch alloy wheels; DAB radio; Artico leather and Bertrix fabric upholstery; Active Lane Keeping Assist; Speed Limit Assist; Keyless-Go starting function; and air conditioning. The Sport trim line adds LED high performance headlights; 17in alloy wheels; Artico and Fléron fabric upholstery; and automatic climate control. 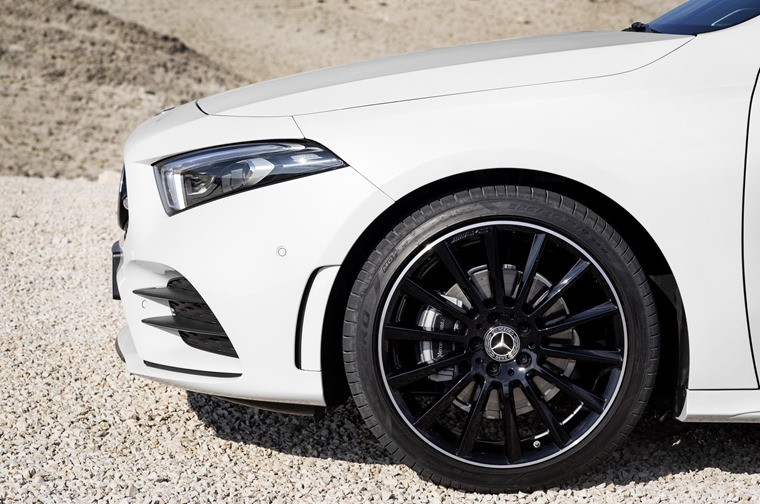 AMG Line customers will benefit from 18in AMG alloy wheels; AMG bodystyling; Artico and Dinamica microfibre upholstery; and three-spoke sports steering wheel. Engine-wise, three units are available. The petrols comprise of the A 200 which is powered by a 1.4-litre petrol engine with an output of 161bhp and 250 Nm and can deliver up to 51.4 mpg. For those that want more power, the A250 has a petrol 2.0-litre engine which can generate 222bhp and 350 Nm. It can achieve 45.6 mpg on the combined cycle and can accelerate from 0 to 62 mph in 6.2 seconds with a top speed of 155 mph. The 1.5-litre diesel A180d will be the only diesel available at first producing 116 hp and 260 Nm of torque. It delivers up to 68.9 mpg on the combined cycle, with a top speed of 125 mph. It can sprint from 0 to 62 mph in 10.5 seconds. Two further diesel options are now available, with a 2.0-litre unit producing 148bhp in A200d form, and 187bhp in the A220d. The latter gets seven-second 0-62mph time and a top speed of 146mph, and both come mated to an eight-speed automatic gearbox. A six-speed manual remains available on the A200, an updated seven-speed automatic transmission is standard across the range. While details are still low on the ground, a plug-in hybrid version is apparently in the work. Safety tech has been ramped up too, and all new A-Classes feature Adaptive Brake, while other driver assistant packs such as Attention Assist are also available as an option. Gorden Wagener, Daimler AG’s chief design officer said: "The new A-Class embodies the next stage in our design philosophy of sensual purity, and has the potential to usher in a new design era […] presenting modern luxury at a level previously unattainable in this class, and transports the user interface into the digital age."